Maybe it was a Christmas hangover (too much excitement from the Christmas crackers perhaps? ), but I woke up on Day 90 feeling like crap. I was moping around the house when our family friends and neighbors Mark and Jen, who helped me crash that wedding back in November, came over to my parents to hang out. At one point during their visit, we all started talking about the blog. This happens a lot when I'm around. My sister-in-law Katie and Mark are two of the blog's biggest fans. In fact, there was a bit of trash-talking between them as to who was the bigger fan. I challenged them to prove to me who was the blog's biggest fan by finding me something to do for the thing I've never done before on Day 90. 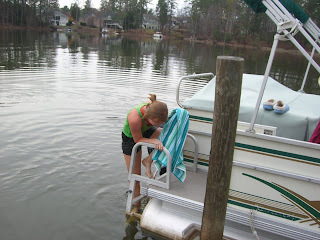 We tossed a couple of ideas around, none of which sounded appealing, when my brother Jeff, who I don't think reads the blog at all, looked out the window in my parents' kitchen at the lake and said, "How about a polar bear plunge into Lake Murray? The cold water will make you forget about feeling sick." 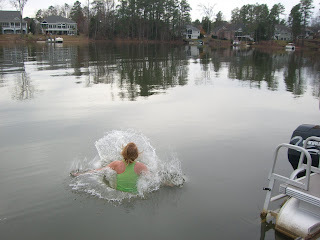 I had considered a polar bear plunge for the blog, but I always thought that I would do it into the ocean. I had done some research, and even considered taking a trip to a beach I'd never been to in order to make it happen. Many towns organize these plunges, and large crowds of people trek to the shore and then go running, as a group, full speed in to the surf. I liked the camaraderie of that kind of plunge. I also assumed that the only way I would actually do it is if I was surrounded by other people. In my head, I also thought my plunge would happen after I had gotten a spray tan, and after I spent months in advance working out. And I assumed that if I allowed people to take pictures of me doing it, I would have applied the appropriate amount of waterproof makeup. Evident by these pictures, none of these scenarios played out in my actual execution of the plunge. No makeup, no spray tan, little working out as I made Day 90's thing I've never done before perform a polar bear plunge. Yikes. The total time from the suggestion of the plunge to actual execution of it was no more than 15 minutes. That included me putting my contacts in and changing into shorts. Being that it was December, I left all of my swimsuits in Atlanta. The only suits I could find in my room at my parent's house were ones that I wore in high school, and that wasn't going to happen. I opted for a pair of dance team shorts instead, circa 1997. I'm not sure that was a better choice. Everyone was waiting downstairs, cameras in hand, for the big event. Their excitement was encouraging, but I was beyond nervous. I was hands shaking, stomach in my throat kind of nervous. Concerning, especially since all I was doing was jumping off a dock into cold water. In South Carolina. I know others who have done polar bear plunges in much colder climates and even colder water. If Mountain Man plunged into the icy waters of New England in January, then certainly I can do this. And if I can't do it, I thought, then how am I ever going to have the gumption to jump out of a plane when it is time to sky-dive? There's no way. So with the paparazzi ready to snap photos, we headed out to the dock. I thought about taking a long running start, but this whole experience was dramatic enough as is. No need to add to the drama. A short run would suffice. It was time for the jump. I thought briefly about backing out, considering what the neighbors across the cove were going to think. But actions void of reason like this one require quick action. I had to stop thinking and just do it. So I did. Jeff was right. I forgot about feeling sick. I couldn't feel anything. My hands, my toes, my arms and legs were all acting independently from the rest of my body. The cold water shocked me, but it was exhilarating. I didn't jump very far from the dock and the boat, but with everyone watching me waiting for my reaction, I felt like it took me forever to swim back. Like I was swimming through molasses. 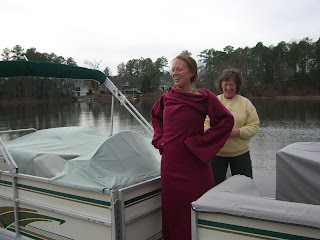 My mom was waiting for me on the boat with a Snuggie and slippers. It was very comforting and very motherly of her. I'd like to take this opportunity to point out that this Snuggie was purchased in 2008 as a part of the Gallman's "As Seen on TV" Christmas. We were among the original Snuggie owners. So to all of you who got team Snuggies this Christmas and think you're so funny and clever for ordering something off TV, I want you to know that the Gallmans had them first. The plunge didn't go down like I thought it would. It was unplanned, terribly ungraceful and imperfect. A lot like life, I guess. I certainly didn't expect this silly stunt to be emotional in anyway, but when I jumped into the water and looked back at the dock to see six of my favorite people smiling at me, I felt so supported and really loved at that ridiculous moment in time. They were all rooting for me to jump into the cold lake (probably so they could laugh at my stupidity). But they're really rooting for me in life. The water was cold, but I felt all warm inside. Later that day, I checked Facebook and saw that Katie had updated her status, "Katie Calhoun Gallman loved watching my sister-in-law Steph jump into Lake Murray today" and it made me smile. I am still laughing as well as warm and fuzzy. Feeling the love of family! Hilarious! Are those the black practice leotard/bike-shorts uniform shorts???? Way to go! HAHAHAHAHAHAHA! The pictures make the post! So fun and sweet! Wow, how wonderful that post was. Steph I loved reading it. YA cant beat family....EVER..so supportive yet in some strange way like a crowd of NASCAR hoping for a wreck!!! The Snuggie photo was the best! Steph - this was hilarious. One of the best yet.